In 2012, Chris was given the ultimate accolade of being one of the top undiscovered gui-tarists worldwide by the acclaimed international music photographer Robert Knight, who in partnership with guitar manufacturer Fender was searching the globe to find the next great guitarist. Footage of the youngster playing in John Henry’s rehearsal studios in London was posted online and his online popularity started to soar gaining millions of hits on YouTube. He then became Twitter’s most followed blues guitarist worldwide. 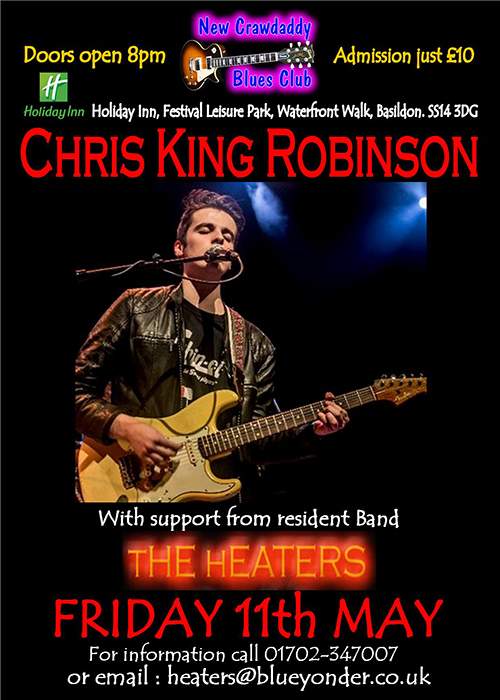 Chris’s first single ‘Lipstick On Her Cigar’ hit No.1 on the iTunes & Amazon Blues charts after just one day of sales and, in 2014, Chris formed his own 4-piece group which quickly gained recognition as one of the most exciting live bands in the country. The band consists of Tom Relihan, drums, and Nigel Turner on bass. 2015 was the defining year for Chris and his band, fresh from a 2 week USA tour, Chris's debut EP 'Tell Me Why You're Scared' set the world alight by flying to No.1 spot on both the Amazon and the iTunes Blues Album charts. At the age of just 24, this is only the beginning for a guitarist who many think will become the standard bearer for ‘The Blues’ for years to come.